We offer high quality wholesale bags that are used for packaging of products such as rice, flour, salt, chocker, maida, animal feed and more. Made from high quality material, these bags have a high strength and are ideal for bulk packaging of various products. Our range of BOPP bags provide convenience in use, perfect protection for external factors and at the same time do not affect the inherent attributes of the product. We can offer tailor made bags to meet the specific requirements of different applications. 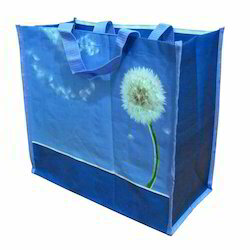 We are engaged in providing an extensive assortment of BOPP shoping Bags that is fabricated form quality raw material. Our BOPP shoping bags are offered with high transparency, clearness, better tensile strength, durability and good print ability characters. These BOPP shoping bags are available in different sizes to suit the diverse requirements of our esteemed clients. Further, we are also engaged in offering customization facility to meet the specific requirements of the clients. Looking for BOPP Multicolour woven Bags ?